In early 2015 Connor Sport Court was purchased by Gerflor, one of the largest manufacturers of commercial resilient flooring in the world. Part of their family of products includes Taraflex™, the courts you saw used in the Rio Olympics for volleyball and handball. Taraflex™ is the most widely specified sports surface in the world and has been used in ten consecutive Olympic Games starting with Montreal in 1976 to London in 2012 for indoor surfaces like handball, volleyball, badminton and table tennis. Although they are relatively new in the American sports flooring market this marriage with Connor Sport Court will boost that market penetration. We are excited now to represent the three major manufacturers in the sports flooring world: Connor Hardwood Flooring, Sport Court Modular PP, and Taraflex Vinyl. 1. Laguna Beach Volleyball Club – Rancho Santa Margarita. 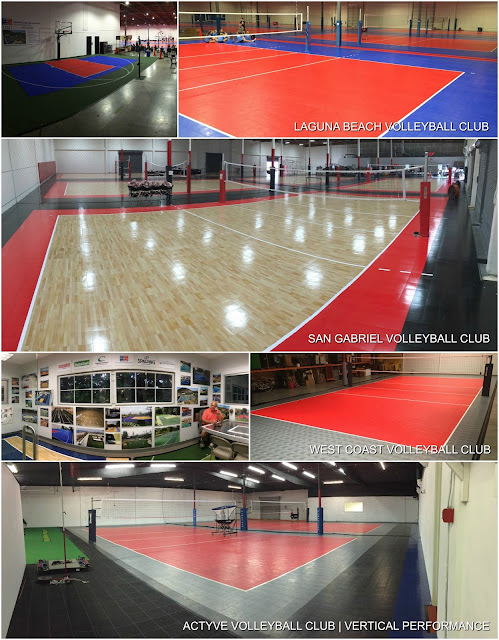 Michael Soylular expanded his club of many years to a new location expanding from 3 courts to 7 courts using our Response flooring. We also teamed with LBVBC and set up one of our popular residential outdoor “Game Courts” and have an office/showroom there as well. 2. Vertical Performance – Actyve VB – Santa Monica. Lainey Gera opened up a Sport Court Response 2 court training facility on Olympic Blvd in Santa Monica. We also have a Sport Court satellite office there as well. 3. West Coast VB Club – El Segundo. Aaron Wexler opened up a facility at the Hydroflex Business complex, a 1 court facility for the development of his club. 4. San Gabriel Valley VB – Los Angeles. Kenji Mukai expanded his club from a 4 court facility next door to a new 7 court Sport Court Maple Select facility. Congrats to these innovators in the Southern California volleyball community. 1. Flooring Options: Sport Court, Taraflex, Connor Hardwood. 2. Other equipment installation: net systems, sub floor, wall padding, netting, bleachers, scoreboards. 3. Other construction/Tenant Improvement: Permits and interior construction for office, lockers, retail, showroom, multi-use. 4. Lease-Financing program. Several of our clubs have utilized this service of ours, for existing clubs only. Lease to own, no large upfront cash needed. 5. Fundraising: Ask about our “Courts for Community” fundraising program Sport Court offers for free. Popular for new start-ups!